Honestly? I don't even know where to begin. This collection of over 65 eBooks, eCourses, and subscriptions is so loaded with information that it's going to be hard to pick out just a few things to tell you about. 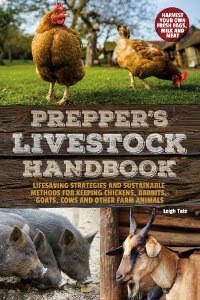 Let's just say it is an amazingly well-rounded collection of everything related to homesteading, preparedness, and DIY. I was delighted to get my hands on an advance copy. What I can tell you is that it covers every aspect of homesteading and then some. Categories include cooking from scratch, DIY, frugal living, green living, homeschooling, homesteading, natural remedies, preparedness, and simple living. Topics cover things like seasonal meal planning, seasonal cooking, freezer meals, the how-to of fermenting fruits and vegetables, a dehydrating eCourse, DIY facial and body scrubs, zero waste cooking, natural cleaning, homeschool planners, kids' chore charts, several cookbooks, rabbits, goats, chickens, bees, gardening, pickling, soil building, herbal remedies for colds, flu, skin problems, natural mothering, homemade beauty products, preparedness checklists, a prepper crash course, decluttering, home organization, homesteading without a homestead, even how to make money from your homestead. And more. 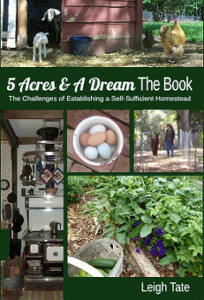 My own contribution includes a 4-book mini-bundle from my The Little Series of Homestead How-Tos: "How To Preserve Eggs," "How To Mix Feed Rations with the Pearson Square," "How-To Home Soil Tests," and "How To Garden for Goats." Click here to see a complete list of what's included in the bundle with links to more information about each. You're probably already familiar with many of the authors. Here are some of the tidbits I found while perusing the various eBooks: how to make scrapple, how to get the gaminess out of wild game, how to clean chicken feet, how to make herb infused honey, 25 ways to clean with cream of tartar, why eating everything on your plate won't solve world hunger, how to make an edc kit, what to do with the pencil shavings I've been throwing away, and a discussion of frugal versus thrifty (I'd honestly never thought about that). And then there are the vendor offers. I've got my eye on the $30 off one case of Tattler wide mouth lids! The only bad news is that this is not a permanent collection. It will only be available for seven days: January 18 - 24. Click here for details, information about purchase options, or to sign up to receive more information. Also! A freebie! The free Back To Basics 15 Day Challenge is an email course designed to share some of the how-tos of working toward a simpler, back-to-basics lifestyle. If you would like to sign up for that click here. Okay, enough hoopla. I really do think this is an excellent resource. 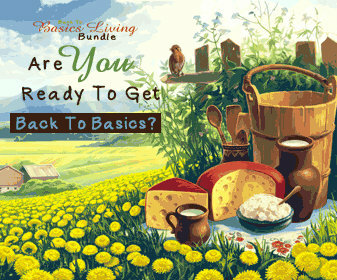 If your budget is as meager as mine is, at least sign up for that free 15 Day Basics Challenge. Or, if you'd like a super-discounted copy of the bundle plus earn a little $$ by offering it on your own blog or website, sign up to become an affiliate, here. I will go check it out. Thanks for the heads up!!! Thank you for the revue, Leigh. BTW, I love your background picture on your blog here...gorgeous! I might sign up for the free course. I need a new set of tires so any extra money is going for that! LOL! Great review! Thank you! I know how it is to have a tight budget, which is why I'm glad I signed up as an affiliate. I think the free course will be good too, although I haven't seen that one yet. It is loaded! I can't use all of it either, but it's still a deeply discounted bargain for the information that I can use. I've check it out, and registered my e-mail for the sale. Thanks for the review, and information.